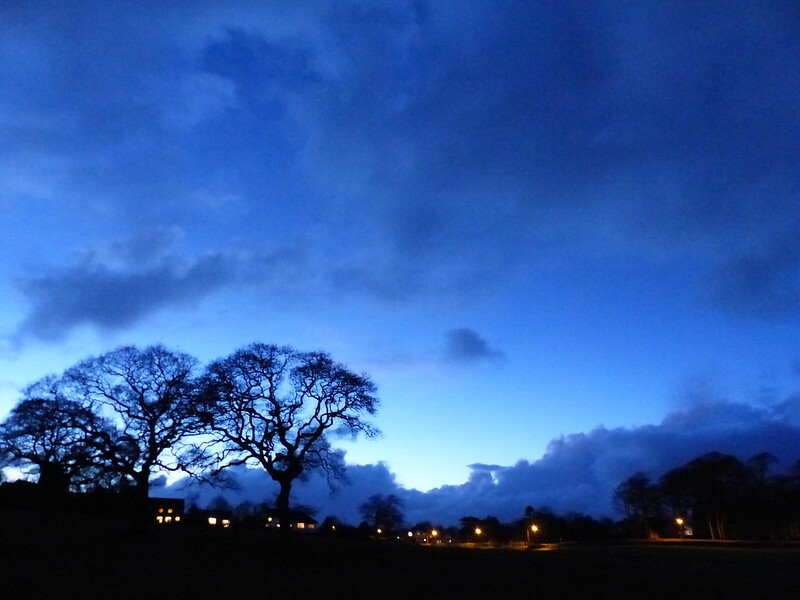 This is what it looked like on the Thursday morning. 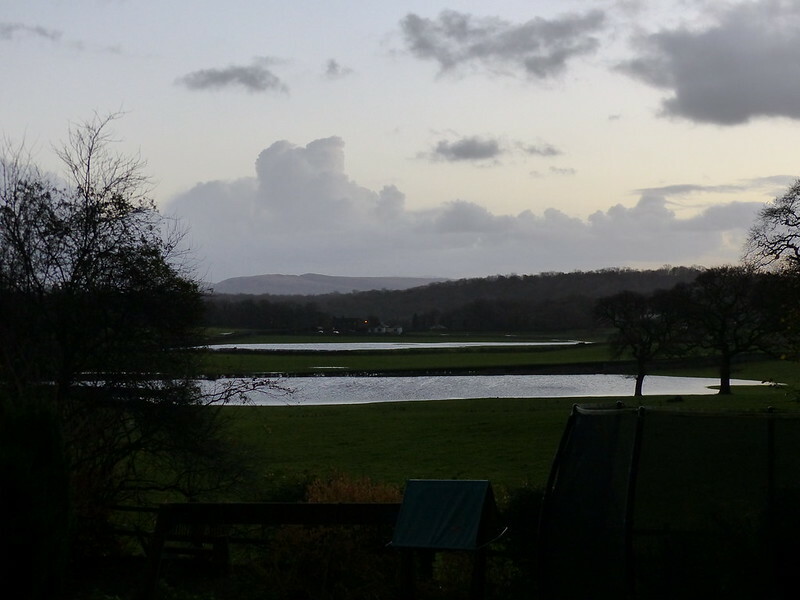 On the Wednesday evening I’d driven through water which, I suspect, I would have baulked at in daylight. After I took this photo, we struggled to commute into Lancaster, having to turn back twice where roads were closed. Of course, every cloud has it’s proverbial silver lining. Where I saw flooding, the DBs saw an opportunity. On the Wednesday night they’d already been out together for a ‘paddle’, or more accurately, a wade, in the temporary lake. On the Thursday they decided to go one better. 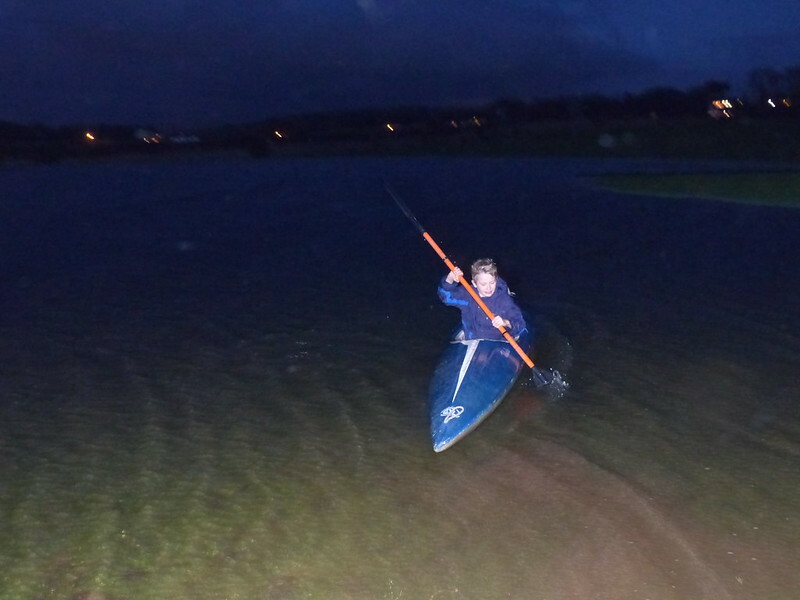 And paddle a kayak in the field. It was windy, and pretty cold, so we didn’t stay out for long, but it was an unusual experience, to say the least. After Silver Sapling we had one night at home, but didn’t unpack the trailer, because we were straight off again the following day, this time to Waterside House on the shore of Ullswater, once again with our friends Beaver B and G and their family. On the first day, after we’d pitched the tent, we inflated the canoes and spent the remainder of the day enjoying the lake. 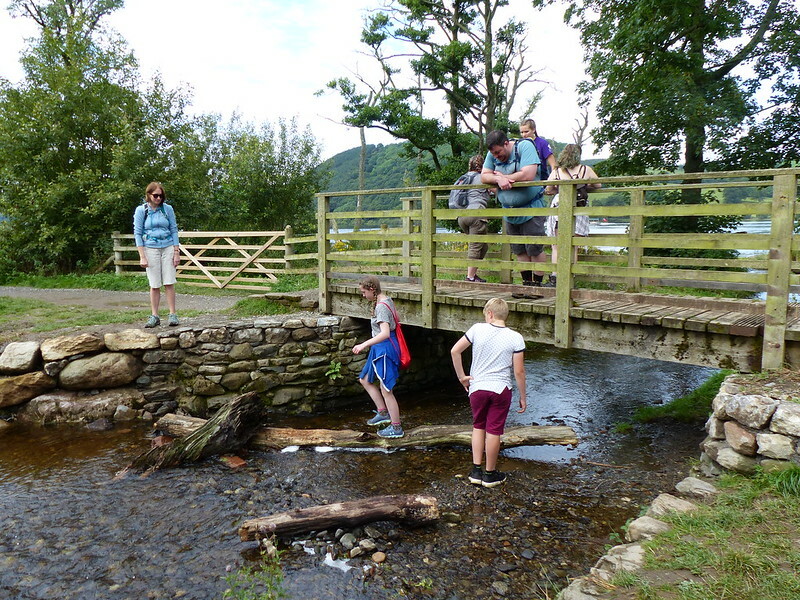 The following day we took a short stroll into Pooley Bridge. It wasn’t far, but there was plenty of entertainment along the way. 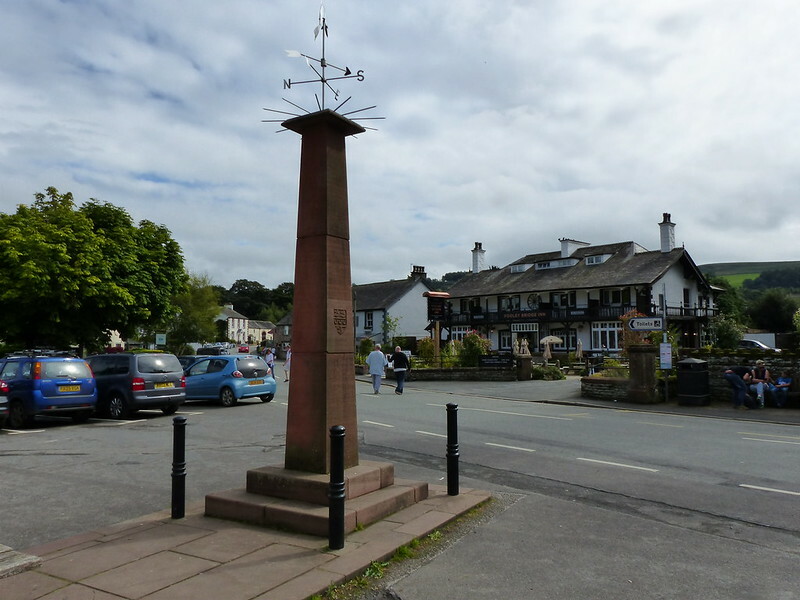 Pooley Bridge is not a huge place, but TBH and G wanted to fully explore all of the shopping opportunities it had to offer. Fortunately, the sun came out and those of us who wee not so interested in tat could settle down on a bench and watch the world go by. Browsing concluded and ice-creams consumed, we moved on for an ascent of Dunmallard Hill. This was Little S’s brainwave; seeing it from the campsite, he’d announced his intention to climb it. 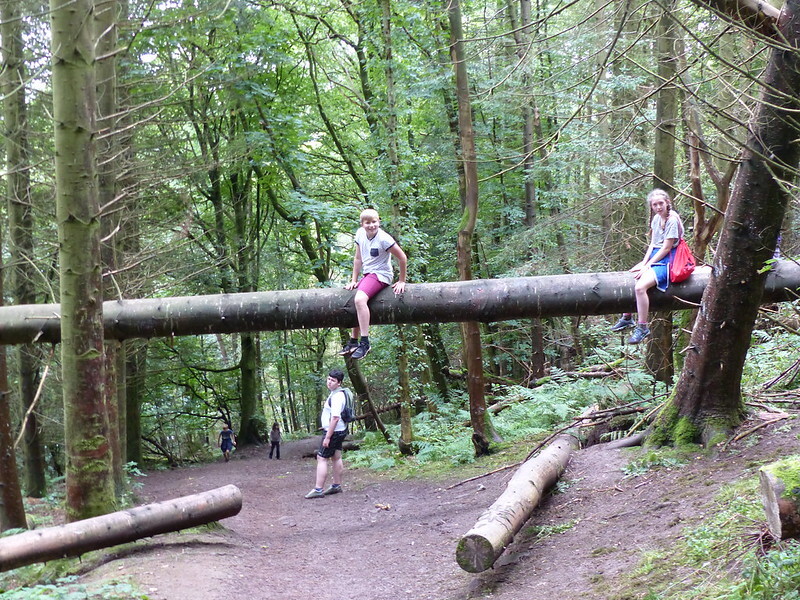 The kids also selected the route, a frontal assault which turned out to be ridiculously steep and which I think some party members will remember for all the wrong reasons, having not enjoyed it at all. To add insult to injury, there are no views from the top because of the trees. Fortunately, there are other routes from the top, one of which we used for our descent, finding opportunities for feats of derring-do en route. 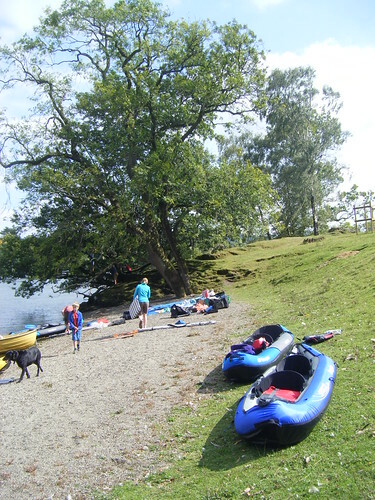 The principal reason for choosing the campsite was it’s lake-fronting location and we got out in the boats every day that we were there. 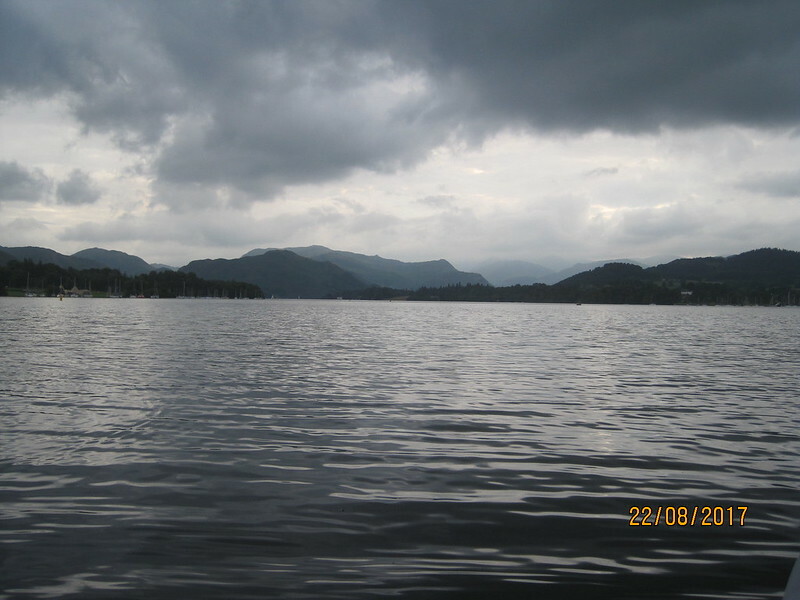 A view from the water gives a whole new perspective on the Lake District and I found it very relaxing, even though the weather was a bit mixed. 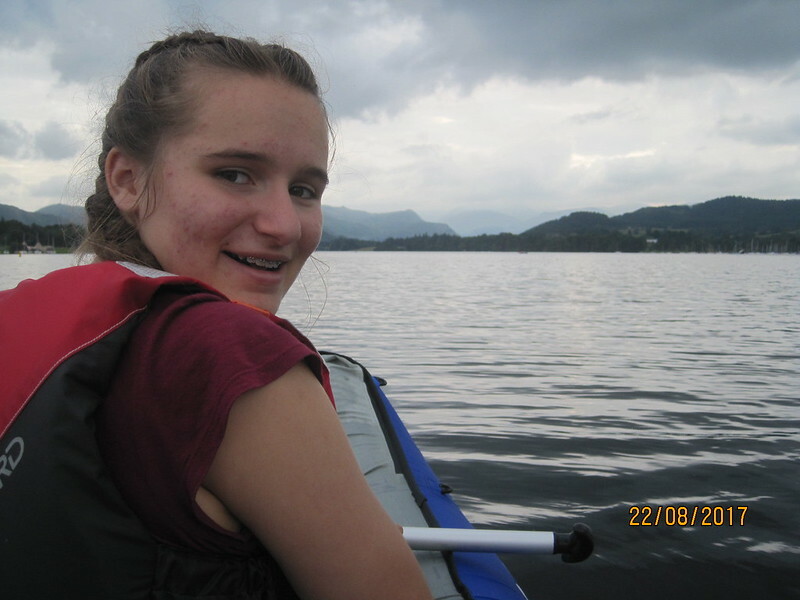 A in particular seemed to agree with me and, with her friend E, probably used the canoes more than anybody else. …here with our friend G.
We didn’t go very far, but we didn’t need to. Down to the yacht club at Thwaitehill Bay a couple of times was the furthest. 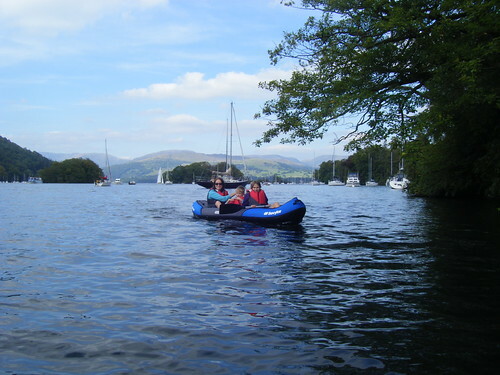 (Dinghies can be rented there we found, something I’ve stored away for future planning). 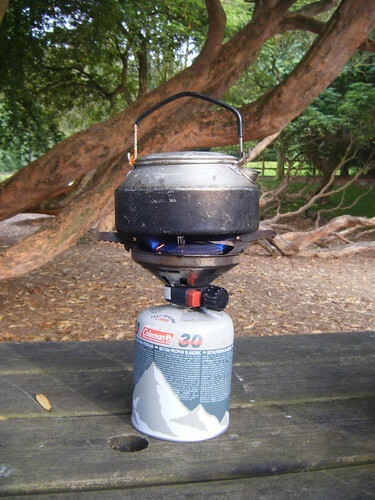 The campsite was excellent, we would definitely go again. The showers were good. The toilet block closest to us was a sort of upmarket portacabin, but it was always clean and perfectly adequate. There’s a small well-stocked shop and a take-away kiosk. The site was busy, but very quiet at night. The ground was water-logged – we saw one car get really stuck in the mire. 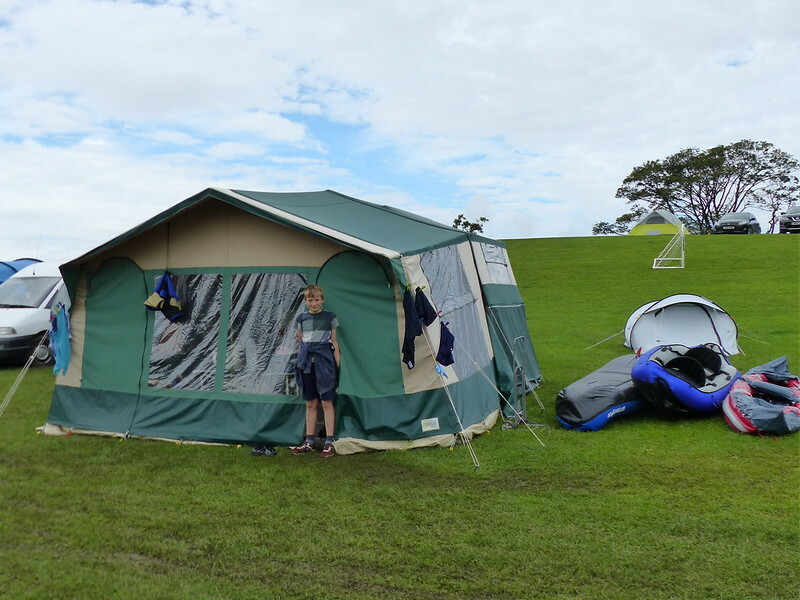 For that reason, we put the trailer-tent on a bit of a slope, which isn’t ideal, but it worked out okay: we managed to pitch it with the beds level after a lot of help from our friends. The big advantage for us was the access to the lake shore which, hopefully you can tell, we really enjoyed. A Paddle to Wildcat Island. 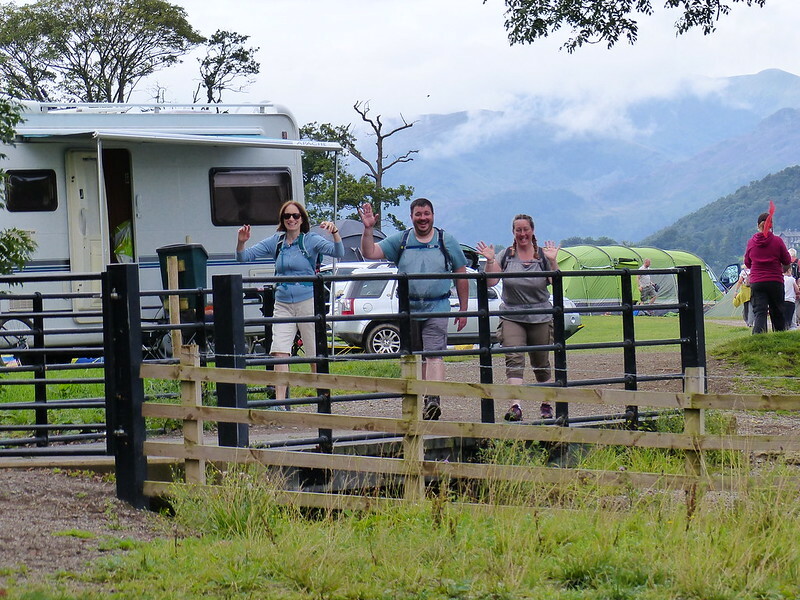 The day after our exertions on Scafell Pike and the forecast had changed considerably, with the weather now expected to stay fine for most of the day. 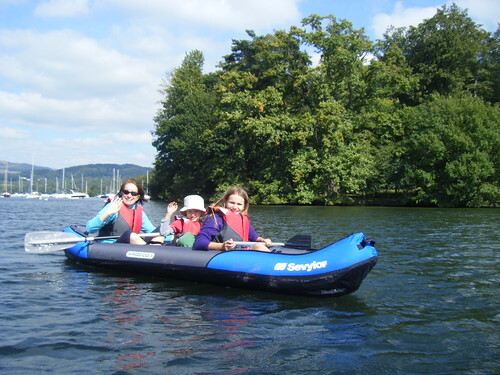 We packed the inflatable canoes into the car and set off early, hoping to get one of the parking spaces at Low Peel Near on the minor road which runs up the eastern shore of Coniston Water. I think that we were the fourth car there, although it transpires that far more cars can squeeze in there than I ever would have expected. 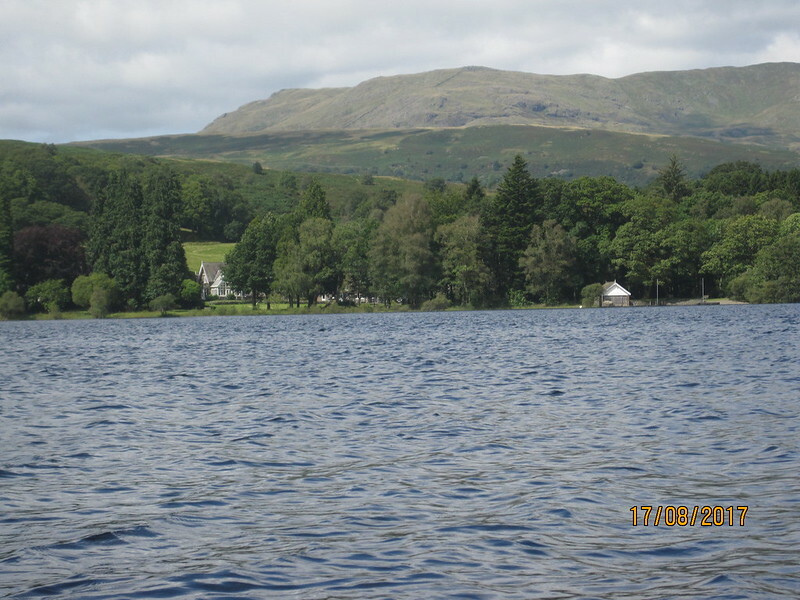 We’ve had previous messing-about-on-the-water trips to Coniston Water, but have always parked at Brown Howe on the opposite shore. 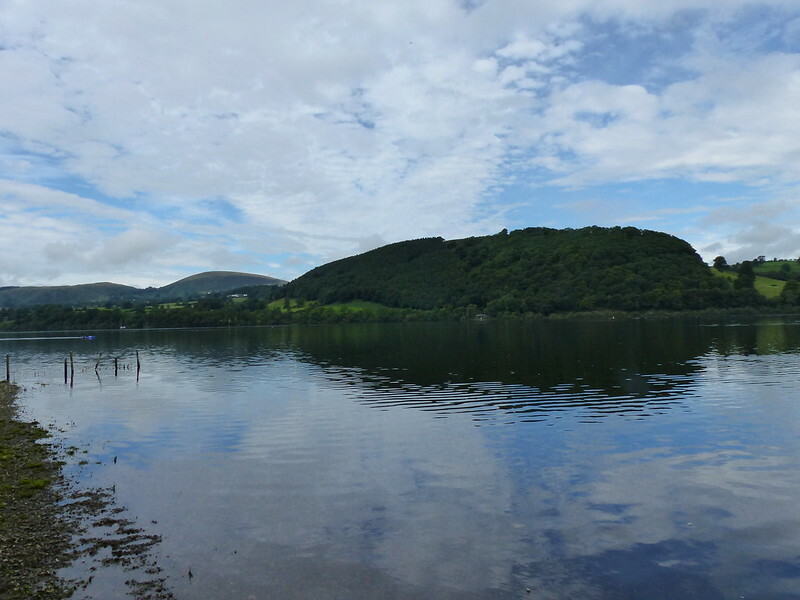 We’d switched the venue because I’d done a bit of googling the night before and discovered that Peel Island, in the lake, is considered to be one of the inspirations for Wildcat Island in the Swallows and Amazons books and was also used as a location for the recent film. 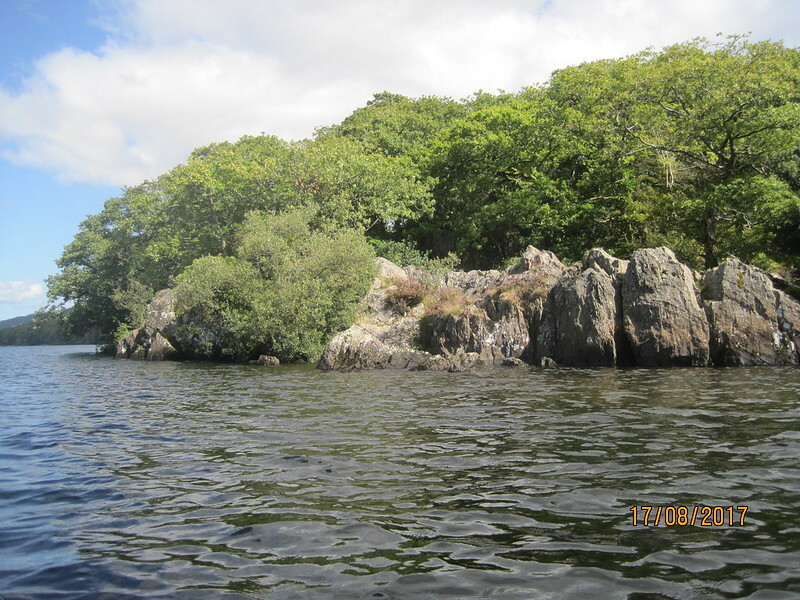 It’s close to the shore and not far from the launch spot at Low Peel Near, so ideal for the focal point of a canoeing trip. 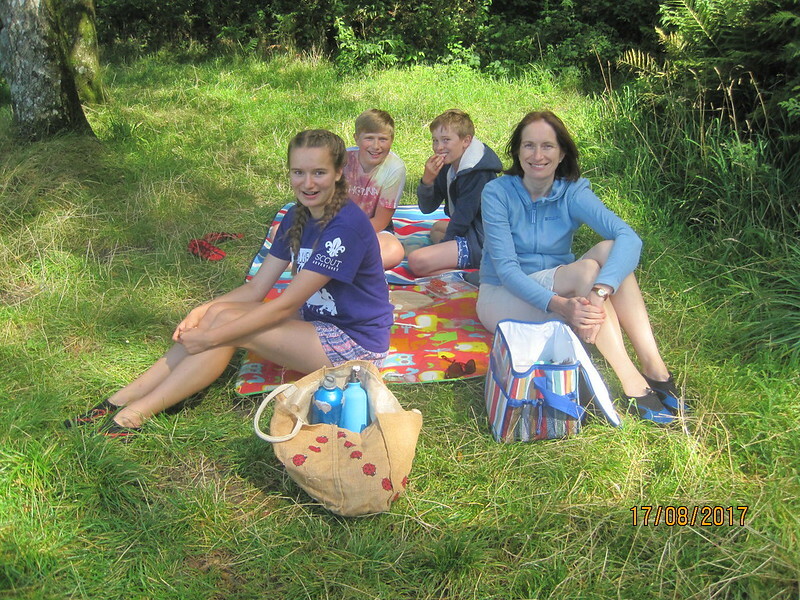 After we’d rocked up and inflated the boats we had a short trip out then paused for our lakeside picnic and brew. 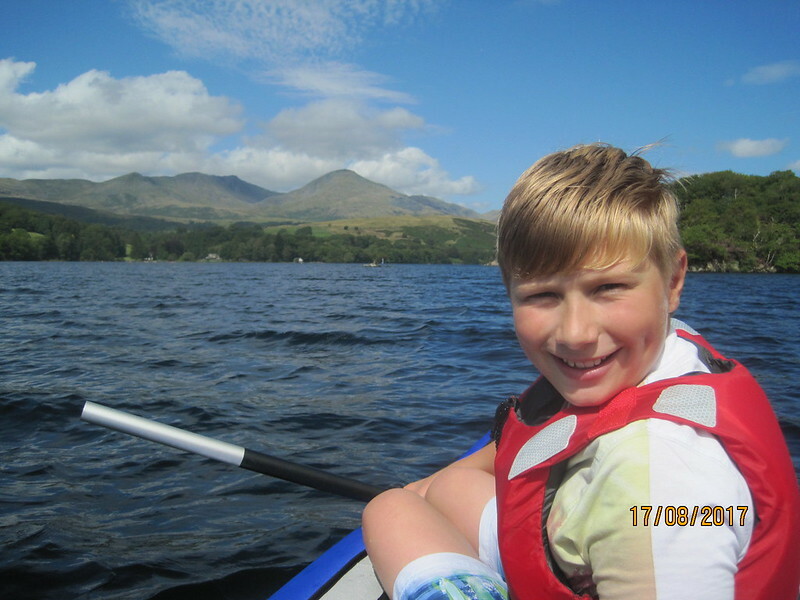 I really enjoyed the canoeing. 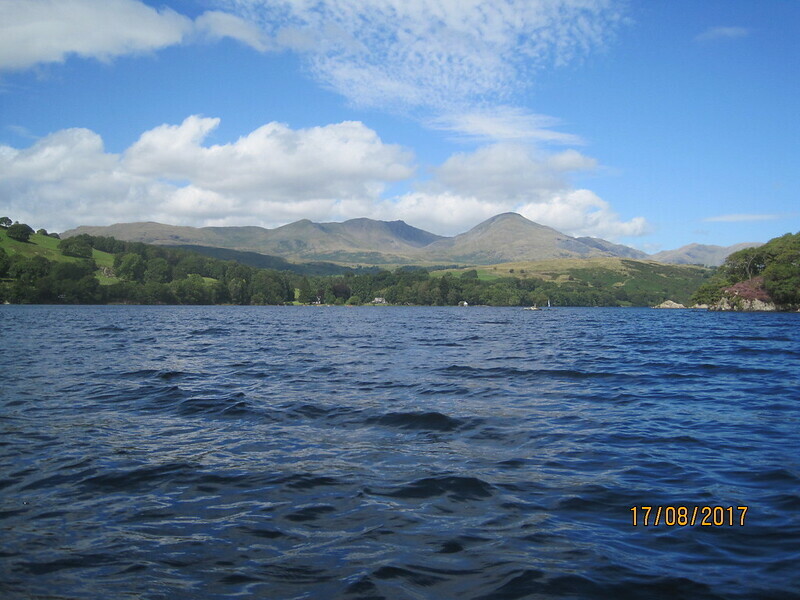 The splashes of the steady rhythm of the paddles in the water were very relaxing, and the views across the lake to the Coniston Fells were stunning. 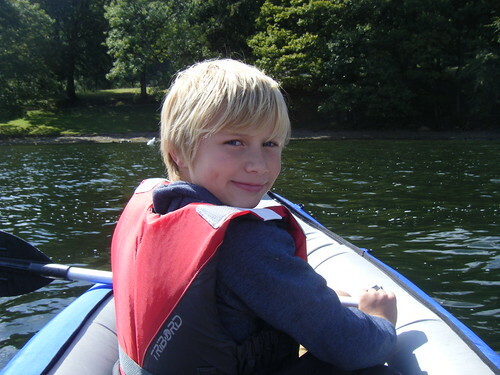 Whilst we circumnavigated the isle, I handed the camera to Little S, since he wasn’t paddling at the time. I was surprised to discover later that he is even more prone than I am to get his horizons off-kilter, often wildly, sea-sickeningly so. …were also used in the film. Eventually, we landed on the island itself. We were far from being the only visitors, but that didn’t seem to detract from the experience. 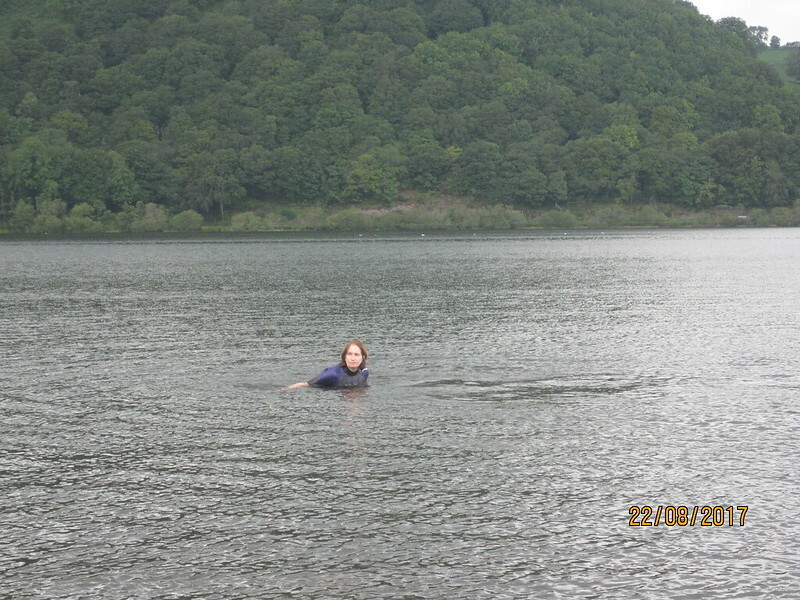 …venturing into the lake for a swim, at which point I decided to join the fun. Whilst we were on the island, the wind picked up and paddling back against it proved to be a bit of a battle. Here we are at the end of the afternoon, just be for we began to pack all of our kit back into the car. Paddling the Periphery*: Harrow Slack, Lilies of the Valley, Belle Isle. 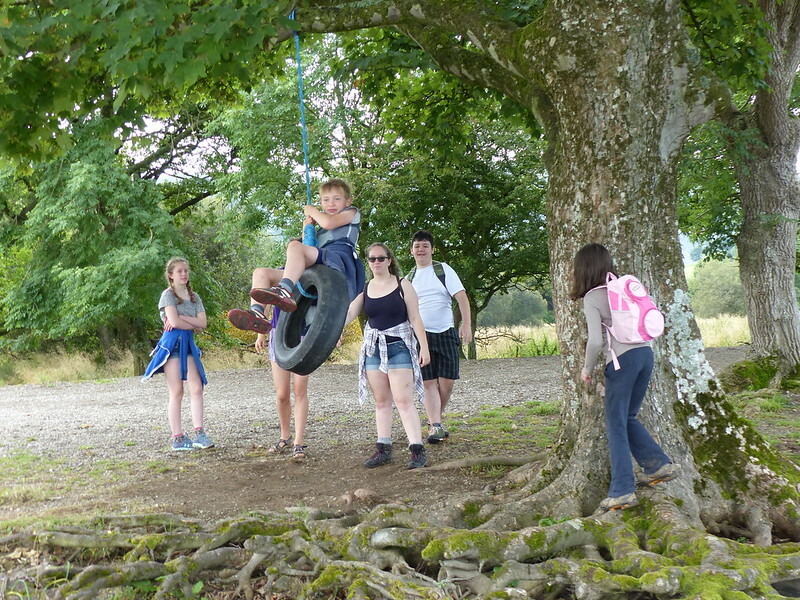 Once we’d decided that we would spend some time at home together over the summer, we resolved to try to get out and be active, turn our hands to something new from time to time, generally make the most of what’s on offer on our doorstep. We tried archery, not once but twice. 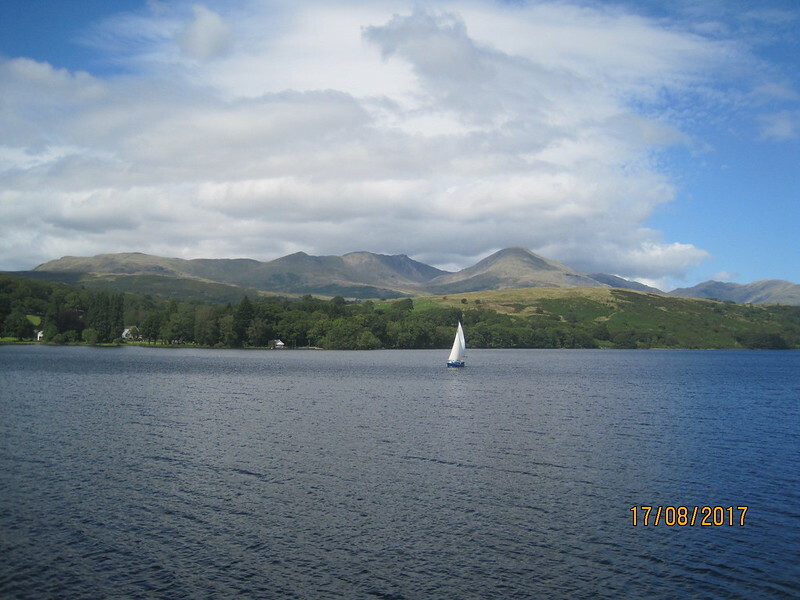 We cycled along the shore of Windermere, and would have cycled again, but for difficulties with a defective cycle carrier. 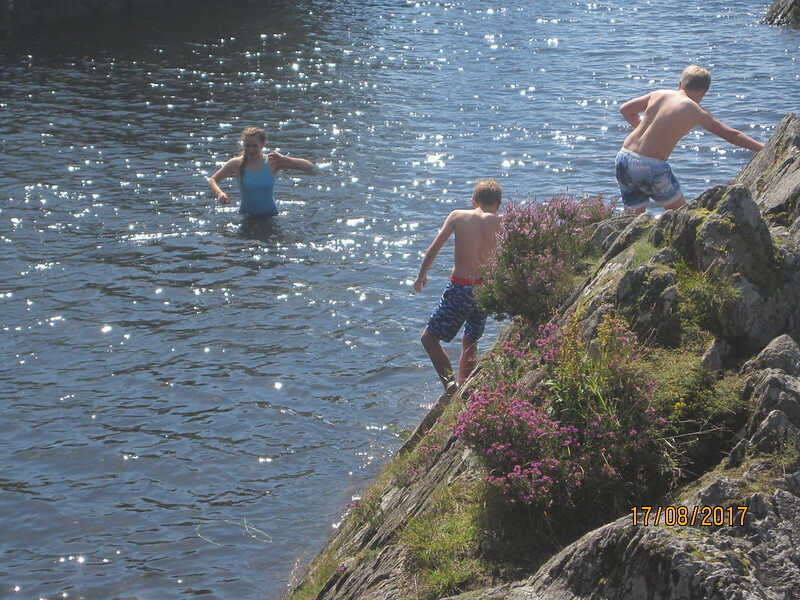 The boys and I dabbled in gill-scrambling. All good. 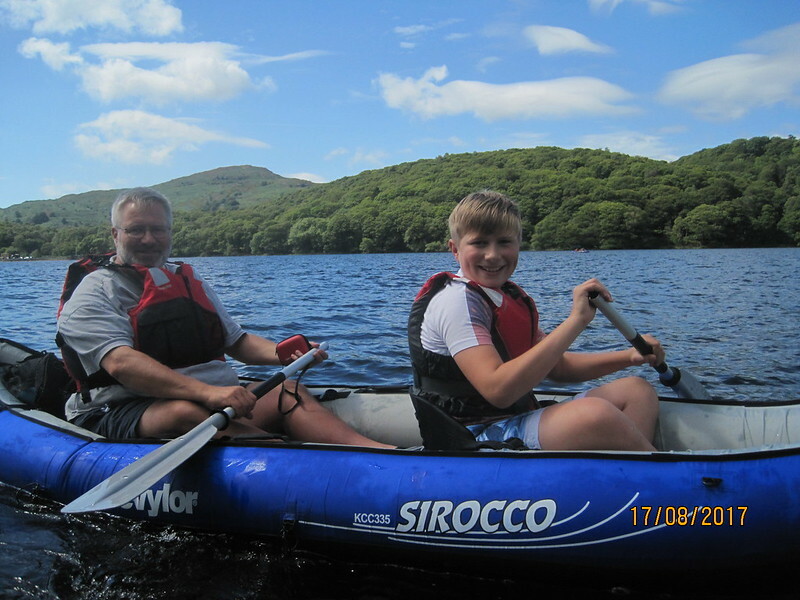 But top of our wish list of things-to-do was a spot of canoeing. Attentive readers will be aware that as long ago as last New Year I expressed a yen to go “messing about in boats: to do some sailing; to buy, beg, borrow, blag, build a Canadian Canoe”. Well we sailed on the Kent Estuary back in May – I don’t think that ever made it on to the blog – but it was terrific fun. 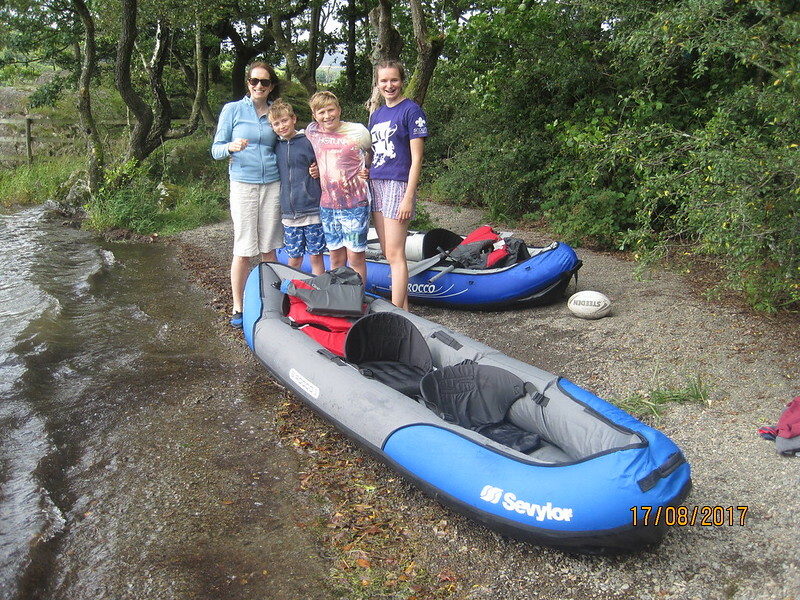 And now we have some Canadian canoes, inflatable ones, having decided to take the prosaic approach of buying them. 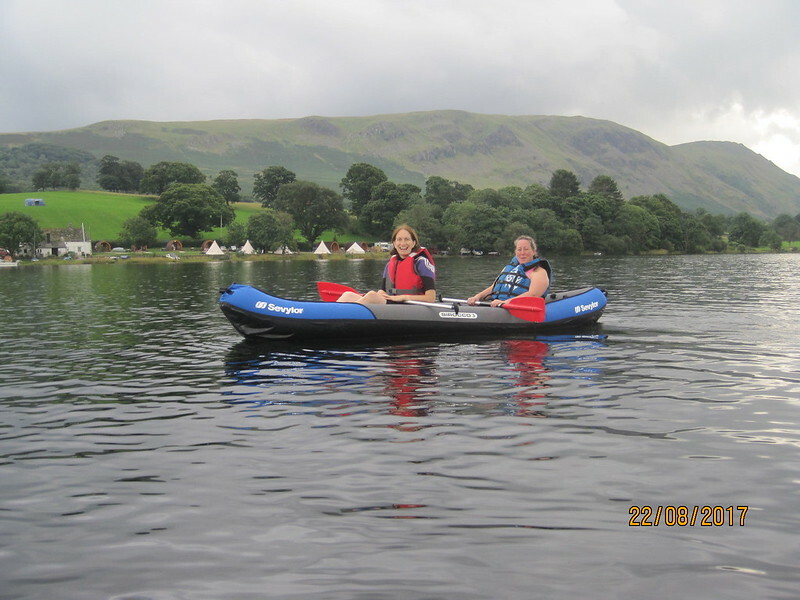 We’ve two canoes, a two man and a three man. I don’t intend to review them, we’re very happy with them, but I don’t really have anything to compare them too or sufficient knowledge to to give an objective assessment. However, there do seem to be some real bargains out there and if you’re interested in some details leave a comment and I’ll get in touch. We’ve had them out three times so far; twice at Fell Foot Park and, sandwiched between those outings, another trip on Windermere, but this time starting on the Western Bank from Harrow Slack car park. 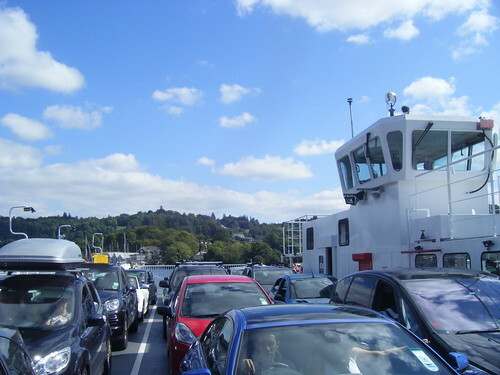 We travelled across to it on the Bowness Car Ferry (above). These photos are from that second trip. It was pleasantly sunny, but very windy. We paddled along the shore with the wind behind us, took a tour around two small islands called Lilies of the Valley and then landed back on the lake shore…. 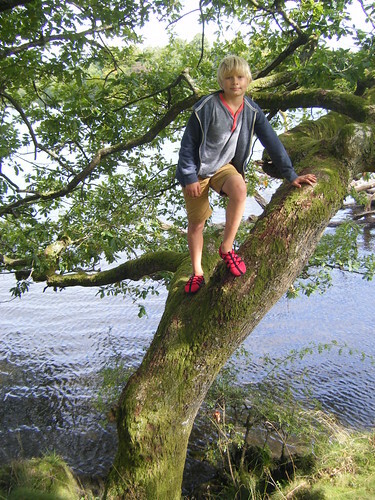 …to stretch our legs, climb trees…. 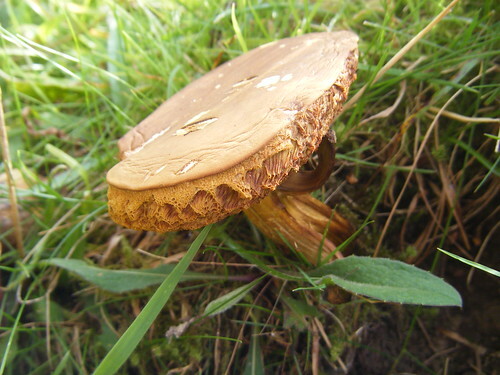 …and photograph the local fungi…. Back in the boats we cruised past the two small islands again and then followed the western shore of Belle Isle, keeping out of the wind which was funnelling down the lake. Belle Isle is comparatively large and is privately owned, with a house on it. Here we are (some of us anyway) hugging its sheltering bank. The two islands behind are the Lilies of the Valley. 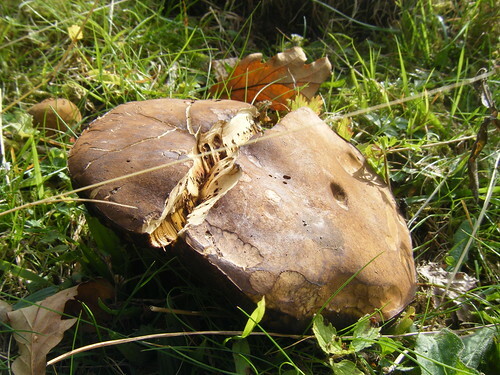 …is from our third trip. 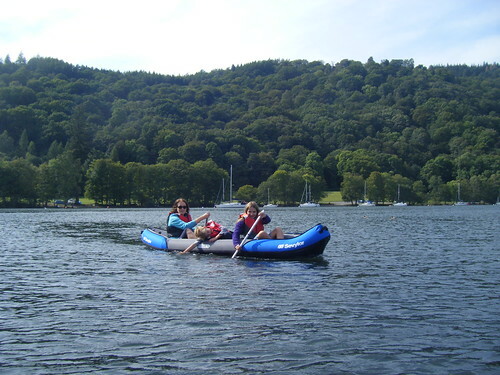 The people in the boat in front are our friends B and M. (Tempting now to add ‘Bargains’ to that, but if instead, I call them M and B I shall only think of Mitchells and Butlers – I dread to think what these low rent free associations say about my character and misspent middle-age?) 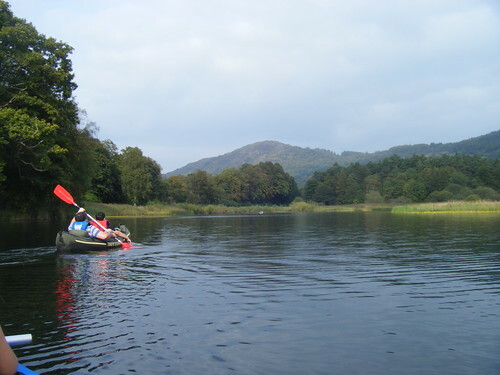 Anyway, that’s our friends B and M, M and B. We’re canoeing on the River Leven. 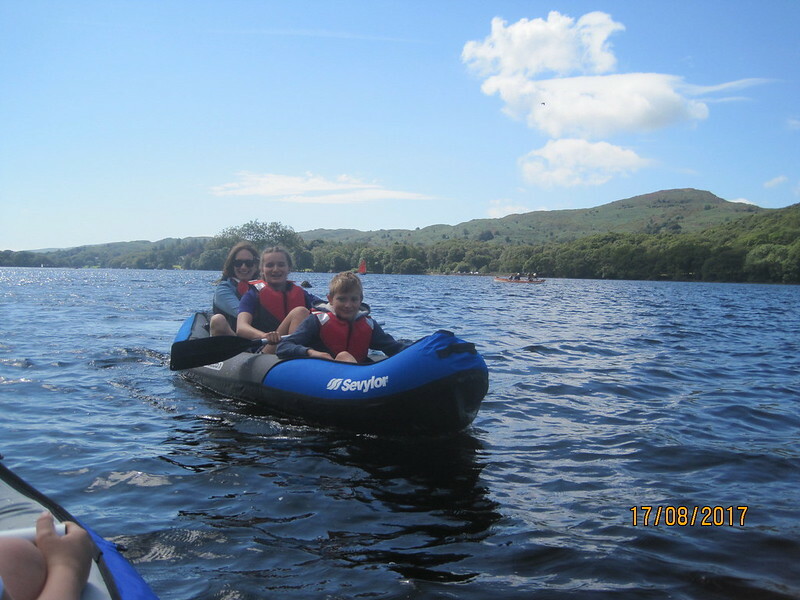 We did that the first time we launched the boats from Fell Foot Park too. Then, the water levels were much higher and there was quite a strong current. We managed okay, but we met others who were struggling. 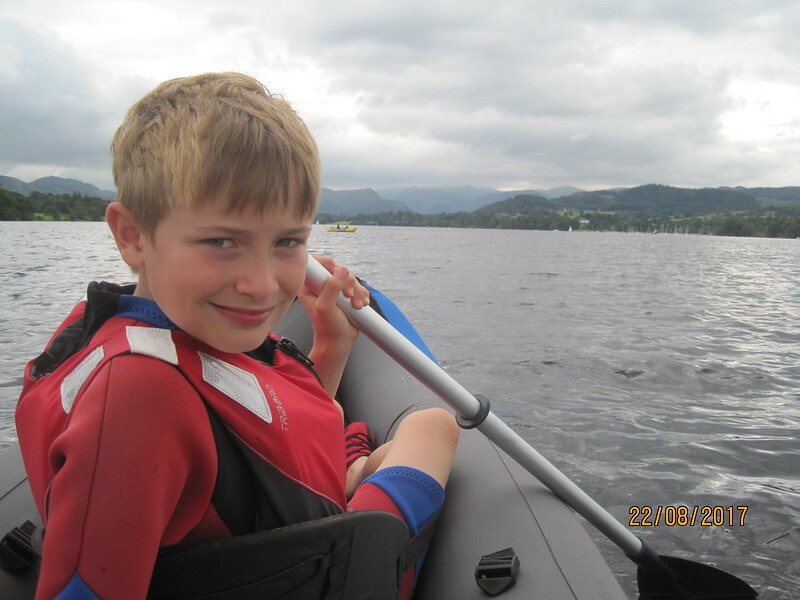 B, who had two kids in an inflatable dinghy which was rapidly deflating, was making no headway at all, and in the end we gave him a bit of a tow to the shore. 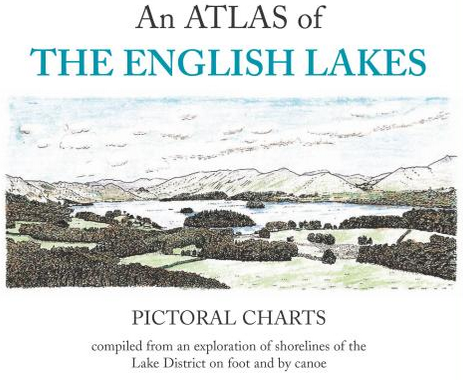 I’ve since found a copy, stashed away sometime ago, just in case I ever got around to buying a canoe, of John Wilson Parker’s ‘Atlas of the English Lakes’. This clip of the front cover pretty much sums it up. It’s a lovely book, a sort of ‘Wainwright for the Lakes’ with hand drawn maps, handwritten text and lots of detail about access, boat launching etc. All that, and it’s published by Milnthorpe’s Cicerone Press. 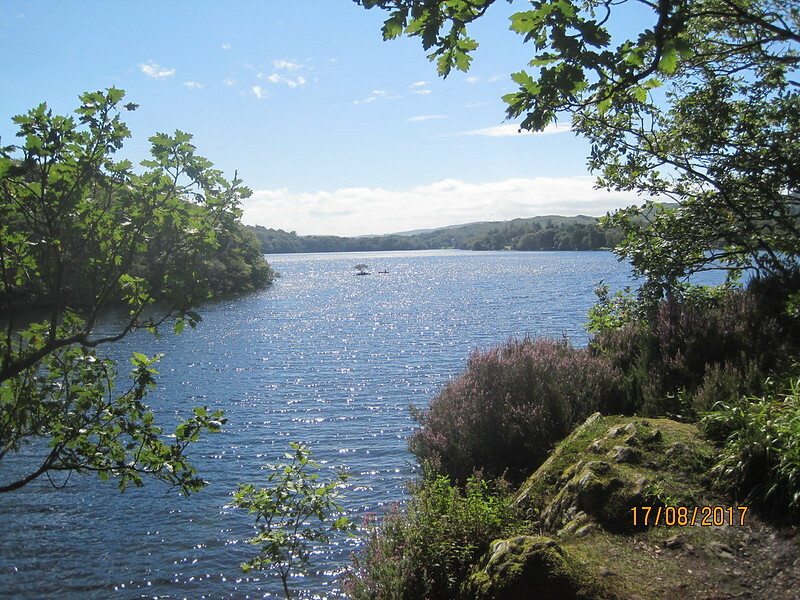 Anyway, he warns against paddling downstream in the rivers flowing out of the Lakes in general, and down the Leven in particular, precisely because there can be a strong current and you’re then faced with paddling back against it. It is a pleasant trip down to Newby Bridge, and just about the right distance for us at the moment, but perhaps we shall have to be a little more circumspect in future. Fell Foot Park has the advantage over Harrow Slack of other facilities besides somewhere to launch – toilets, a play area, a cafe, an ice cream shop, room to throw a Frisbee, picnic tables etc. We try to not be in a position to need the cafe however – brewing the tea is part of the experience. 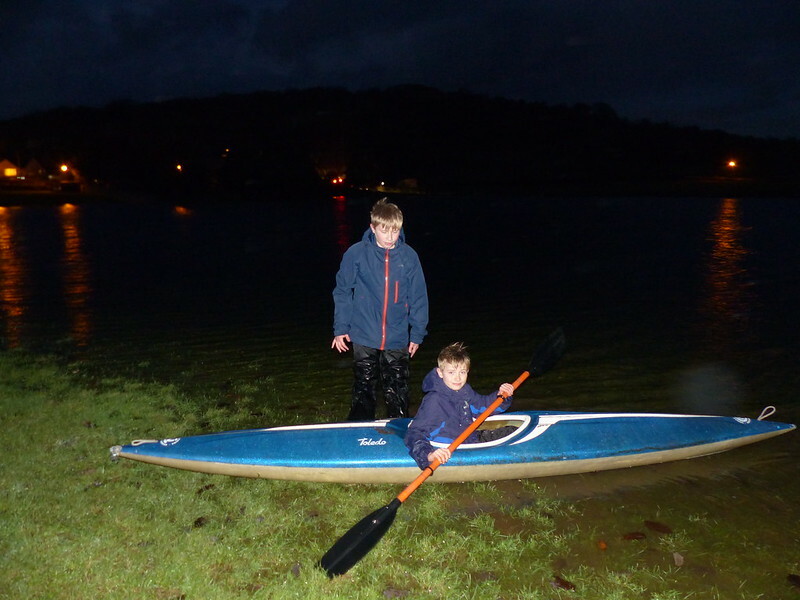 *So will the blog now have a sub-title “Paddling the Periphery?” Credit where credit’s due – this suggestion is from Alan Sloman’s comment on my January 2013 post about wanting to do some sailing and canoeing. Hopefully, there will be many more ‘Paddling the Periphery’ posts to come. (Probably only when the weather is kind though).